Often when people first meet me, they can never guess that I am baker; let alone a self-run party/event cake marker. Sure close family and friends know about my grand hobby but in the streets, parties and University; my oven mitts are hidden out of plain sight. I am not sure why they assume that is the last thing I would be interested in. I have been told I am a bookworm, art geek, music follower, fashionista ( this one I have no clue), all wrong, wrong, wrong. Could it be my outfits, hair, make –up or persona? Do I give off vibes of uncomfortable awkwardness that lead to them to think I am a nervous wreck in the kitchen? Maybe I just have a really god po-po-poker face(lady gaga reference, could not resist). 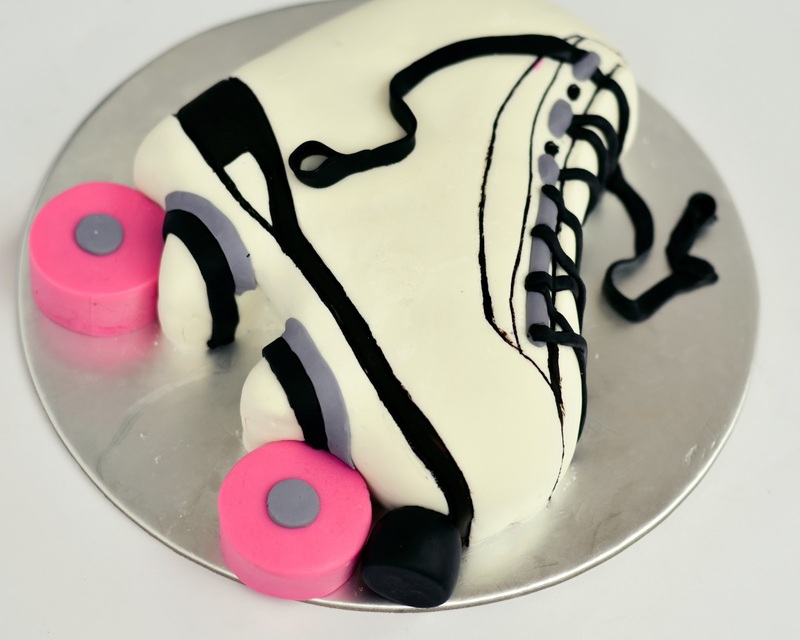 I think it has been about a year and half since I first moulded a cake from fondant. I remember it was my sister who introduced me to is fine art. I think she was going through a baking phase at the time because right now she is into home renovation and interior design. 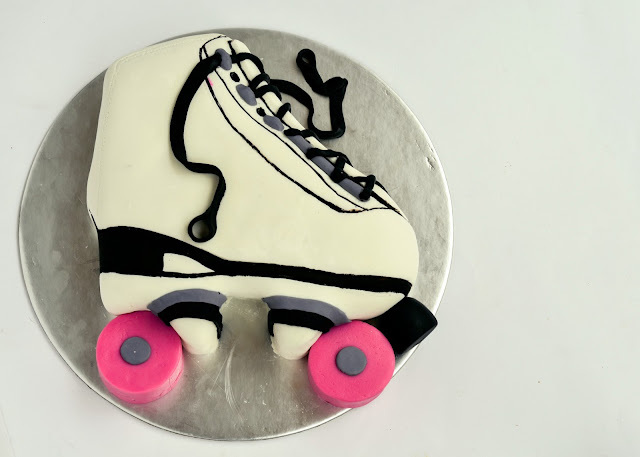 Anyway, the first cake I decorated ever in fondant was at a cake class, from then on I was hooked. I loved it. 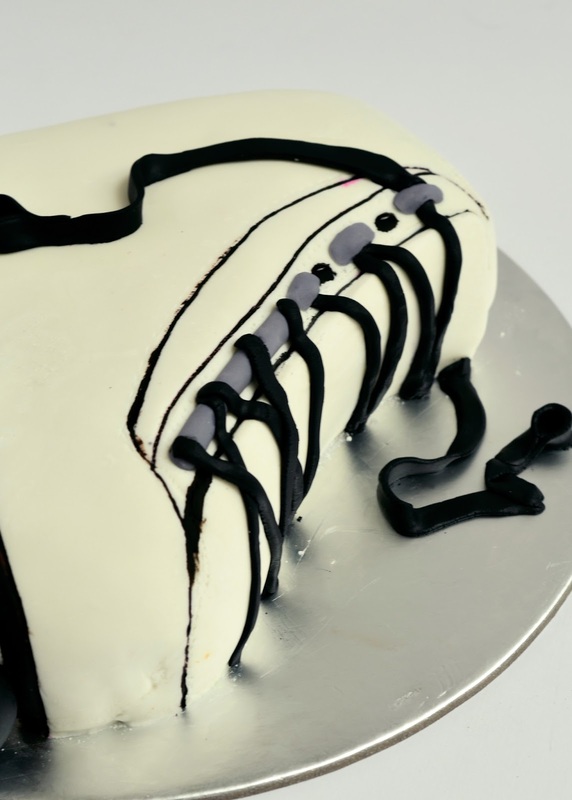 Sugar to create cake into any kind of shape you want count me in! 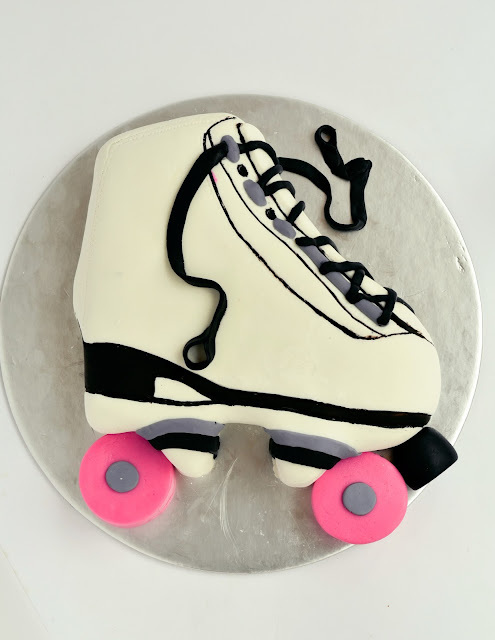 I have done a few fondant cakes on special request ( a girl has got to make money you know). Unfortunately most of the photos I took of them were on a standard digital camera with poor lighting and very unattractive set up (sigh). This is the first one this year I was requested to make by one of my greatest supporters, my mum’s work friend. I cannot thank her enough for her support and constantly coming back to me to do cakes for her many family members. This cake was made for a little girl in Queensland (yes it had to fly interstate, thankful made it in one piece). I was required to make a roller skate shoe to reflect her interest in roller skating. I used the style of the classic retro roller skate and updated it with a few colour changes. The base cake is plain vanilla butter cake with is coated in a milk chocolate ganche, covered in a white fondant and decorated with coloured and textured embellishments. Not too shabby for my first go at a 3D shaped cake, considering I was covered my head to toe in cake crumb and chocolate while putting it together. I designed the cake shape from a skate outline, which I placed on transferable paper. 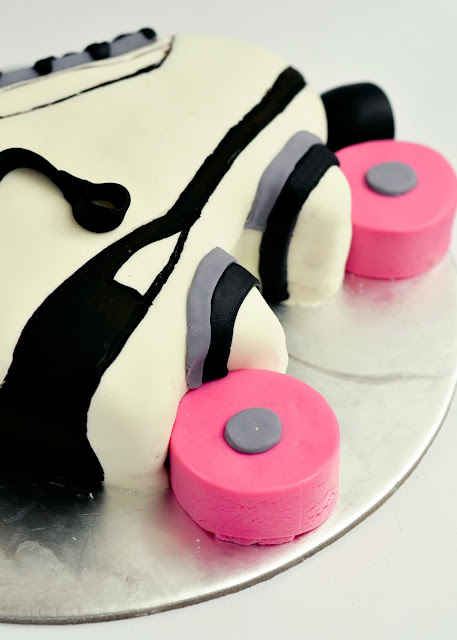 The wheels are pink and grey fondant blocks; the stopper is black fondant, which is shaped. 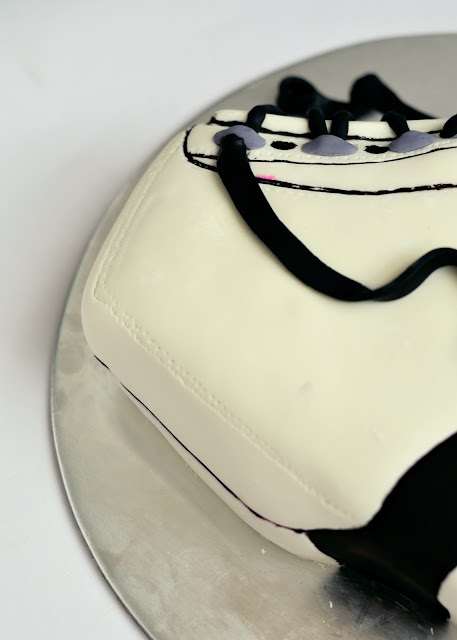 I painted on the hell base and made extra feature with some left over black and grey fondant for the laces and base. For added “realness”, I textured the boot with stitches and lines. 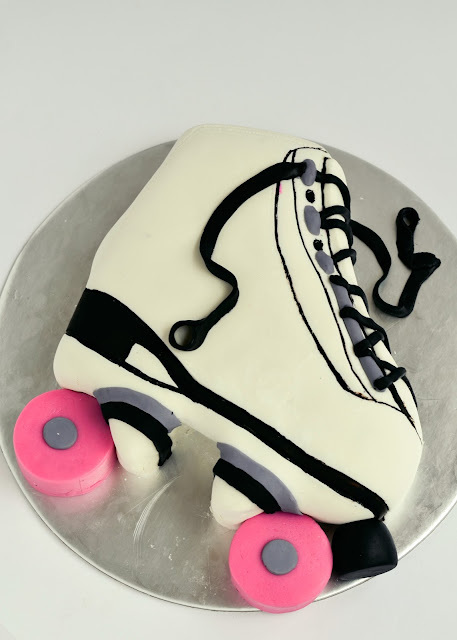 I used the fondant book bible, Planet cake is a large company in Australia that make these cakes professionally. They have a book out which I used a reference because it is simple, clear and they tell you how to make many cakes. More importantly how to fix the mistakes. If you ever get the chance look at it because it is great guide to making your first cake. I am sharing the base cake recipe because it is the foundation to a successful shaped cake. You need one, which is dense but not gummy, tender but not crumby and can handle the weight of ganche and fondant. I adapted it from the recipe found in the book by adding more vanilla flavour and using brown butter instead of normal butter for additional flavour. Browning butter: Place butter in a small and pan. Heat over low heat until it changes colour and smells nutty. WARNING!!! Do not over do it! There is a fine line between just right and burnt. Leave to cool in the fridge until hard. Preheat oven to 180c. Grease and line a 22cm spring form tin with grease proof paper. Make sure it comes above the tin. Cream sugar, and cooled solid brown butter in large bowl. Beat with an electric mixer until light and fluffy. Add eggs in a steady thin stream with the electric mixer running. Beat in vanilla extract and pod seeds. Fold in 1/3 of the almond meal and flour then 1/3 of the sour cream and milk. Repeat this process until it fully combined. Spoon mix into tin and smooth out the top. Bake for 1 hour or until a skewer comes clean. If the cake looks like it is browning too much cover with foil. Leave to cool in tin for 10 minutes then turn out on to cake rack. This is wonderful.So creative! I think it deserves a comment! How did you pack it for posting?